Look, listen and do, but never ask why. Kenosuke Hayakawa, Japanese wood worker. Friday is the only day I get to be in the workshop. Due to circumstances beyond my control, I had to take a day job to cover our bills and with this job I have to work four ten hour days, thus Friday is really the only day I get to myself. Weekends are just that, trying to catch up on yard and house work along with having some fun. Don't worry, by mid-November I will be back in the studio workshop cranking out guitars and capos/cejillas! My studio workshop is a bit of a mess because I have no proper storage for the likes of fretting tools, sandpaper, wood cauls, etc., etc., many of these things make up an organized chaotic mess on the floor underneath the window, or are cached away in cardboard boxes. To remedy this situation and help make the studio workshop look like a real studio workshop, on Fridays I have been making two sets of drawers that will support a work surface. 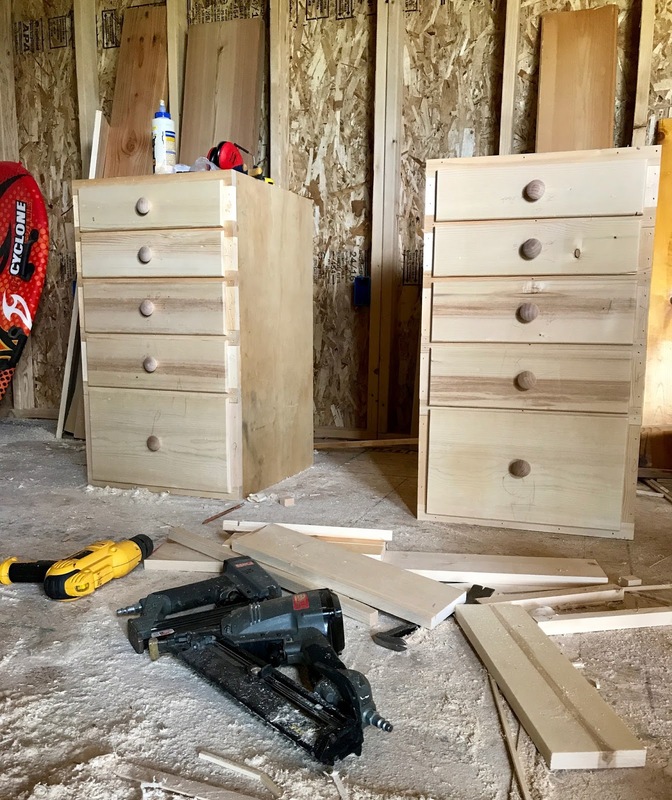 You won't find any dovetails in these drawers, twenty five years ago I discovered that I find cutting squashed triangles a very, very boring task. Rectangles and squares really don't excite me, either. Curves and circles, the shape of a guitar, are much more pleasing to me. A trim nail gun, a router, a table saw and some glue helped me put this very basic, rough and tumble set together. The nail holes were filled, now the set awaits primer and paint. I still need to build a base and the work top. Yesterday, I was able to do some work on a guitar neck that I made about four years ago. It is Spanish cedar with an East Indian rosewood face plate and it is for a guitar with about a 25 5/16" string length or 643mm. When I first made it I tried a different technique for carving the heel, that was using a short knife on a long handle instead of chisels. I almost ruined the neck because of a slip of the knife. 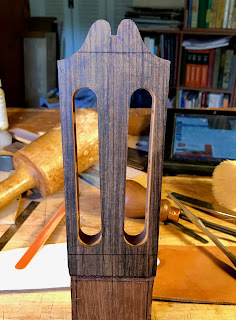 The headstock crest started out in the style of Santos Hernandez, but since I am focusing on making near bench copies of guitars by Hernandez y Aguado, and that there was enough wood left, I cut a HyA style crest. The field between the tuning machine slots will get rabbeted and stippled just like some of the original HyA guitars. It is nice work to do and a bit of a challenge. We have had over ten days of thunderstorms and rain here in this part of Colorado, a very soggy start to August. It's been so damp that I had to fire up the furnace! Lots of mushrooms are popping up and in the above photo you can see that the woodland pinedrops are growing at a phenomenal rate! This is less than one week's worth of growth! This photo shows the saw filer for the Sierra Lumber Company at Lyonsville, California, circa 1900. 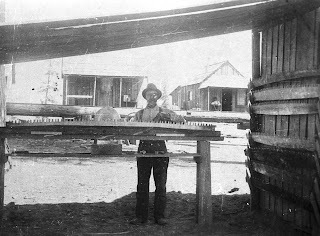 This was an important job in a logging camp, as you can well imagine, especially for the men who worked as buckers. This photo is from the Digital Collections at CSU Chico. 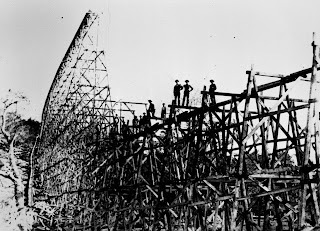 This flume carried rough cut lumber from the Champion Mill in Lyonsville to a planing mill in Red Bluff, California, a distance of over 30 miles. 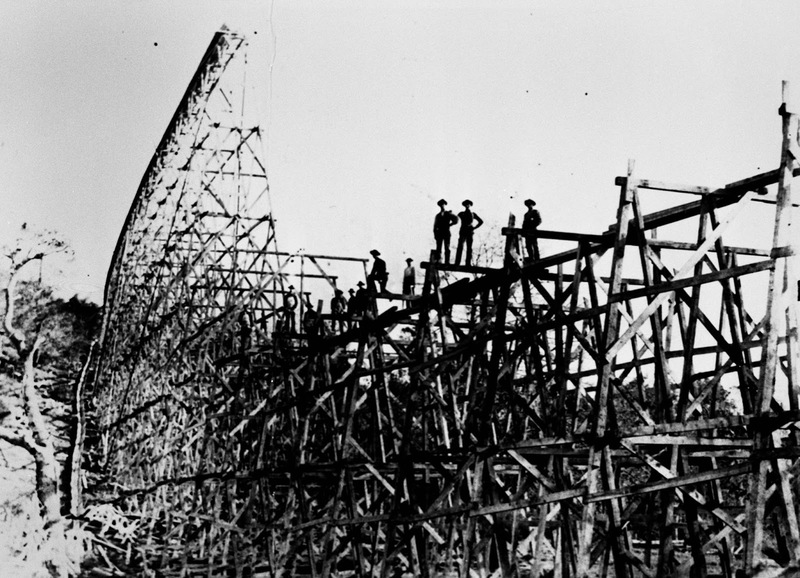 The flume was abandoned in 1914, this photo shows a crew of men dismantling the flume. I was told that my grandfather, Rufus Wilson, helped dismantle this flume, I like to think that he is somewhere in this photo. 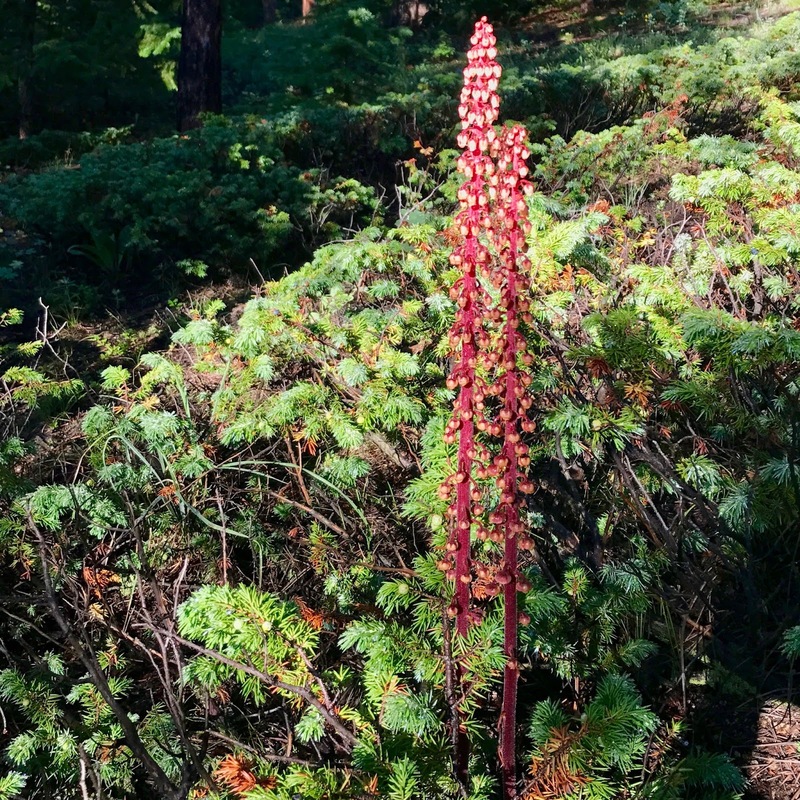 Photo from the Digital Collections, CSU Chico.